A sensory room—a therapeutic space with a variety of equipment that provides students with special needs with personalized sensory input—helps these children calm and focus themselves so they can be better prepared for learning and interacting with others. In April, Edutopia published the story of Meriden Public Schools in Connecticut, including a video about the district’s sensory room at Hanover Elementary School, which provides support services for students with a wide range of special needs. Improved services: Meriden Public Schools students with special needs were previously sent outside the district to receive services. According to Patricia Sullivan-Kowalski, Meriden’s director of pupil personnel, this resulted in students feeling less connected to their community. By creating their own sensory room, administrators gained the ability to keep students in their community and provide them with a safe place in a least restrictive environment. 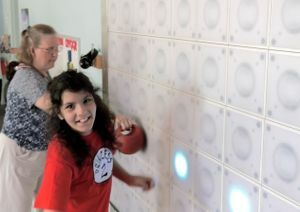 Cost savings: Setting up a sensory room costs less than sending students out for support services. To pay for Hanover’s sensory room, Mark Benigni, the Meriden district superintendent, reallocated support services funds, covering the room and its equipment, staff, and professional development. How Is the Sensory Room Used? What Student Objectives Does It Meet? 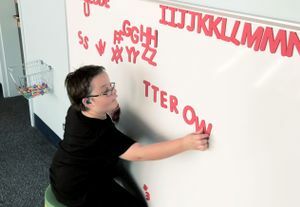 The Hanover sensory room was designed primarily for autistic students, but over time it has expanded to support all students, including those with vision difficulties, language difficulties, learning disabilities, emotional disturbances, all kindergartners, and any student who needs a safe, quiet room to calm their body. “We often find that practices designed to meet the needs of the most challenging students in a school are effective for all kids,” says Peter Poutiatine, Edutopia’s school selection coordinator, who researches successful school practices. Students at Hanover Elementary begin their time in the sensory room bouncing in time to a metronome to build focus. When creating the sensory room, Meriden educators focused on incorporating proprioception, the awareness of where your body is in space, and the vestibular system, the sense of balance. Students with challenges in proprioception appear clumsy—they’re not able to get in line without being right on top of the next student, for example. The educators give these students a lot of so-called heavy work, like bouncing and jumping, to help develop this sense. Students with vestibular challenges have trouble balancing, so they use a platform swing that helps improve this sense. Having students work on their proprioceptive and vestibular systems helps them become aware of how their bodies move and how they can control their movements. A sensory room can be used to meet multiple objectives, depending on each student’s needs. The Hanover room in the video above has a variety of stations that were designed primarily to help students with proprioceptive and vestibular issues be better able to self-regulate. The room measures about 1,200 square feet—it was previously a kindergarten. Bouncing ball: Students always start by bouncing on a ball in time to a metronome. It’s very important to provide consistency, and starting (and ending) each session on a bouncing ball allows for ease of transition and provides predictability. Next, students either do a set rotation among the stations or make their own choices. Circuit rotation or chosen activities: After the ball, a student may do a set rotation, visiting several stations for three to five minutes. 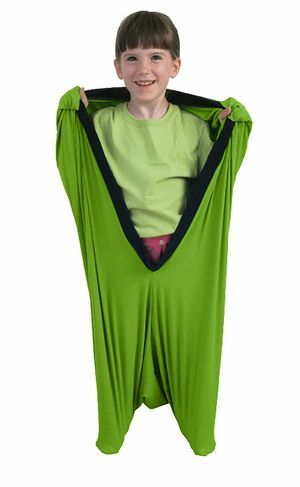 This provides a great deal of sensory input and exposes students to the different areas of the room. Or a student may choose a desired activity and stay there for a directed amount of time. It’s very important that students have enough time in a chosen station to feel the desired effect. Yoga: The occupational and physical therapists have posted images of yoga poses on the walls in the Hanover sensory room, and make themselves available to help as needed. Bouncing ball: Students end each session by bouncing on a ball. Meriden Public Schools’ head of occupational therapy, Kathleen Fritz Romania, and lead physical therapist, Heather McDonnell, designed the room. They worked with others, including the district’s lead behavior analyst, the speech and language pathologist, and the special ed teacher, to ensure that the programming supported specific goals concerning behavior, communication, and academic skills. What Do You Need to Get Started With a Sensory Room? The team at Meriden agrees that you don’t have to spend a lot of money to get started. “If you put down carpet, paint the walls a calming color, and put light fabric over the lights, your students will feel a change right away when they walk into the room,” says McDonnell, the physical therapist. You can also use equipment that doesn’t cost a lot: Therapy balls, battle ropes, and scooter boards are very inexpensive and have numerous applications with students. You can also make your own sensory bins—plastic dishwashing containers filled with rice and dried beans will work. What Equipment Does the Sensory Room Have? 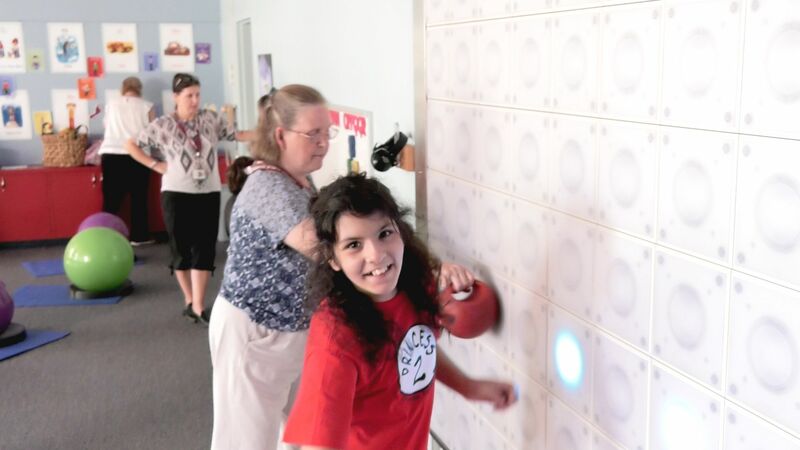 Bouncing balls: When students enter the sensory room, they go directly to the bounce area for opening circle—an exercise in which they bounce on balls in time with a metronome. This provides full body input, but can easily overstimulate some students, so this activity should be closely supervised. Staff members also use the balls to “squish” students, pressing into their backs as they lie on the floor, which provides deep pressure. 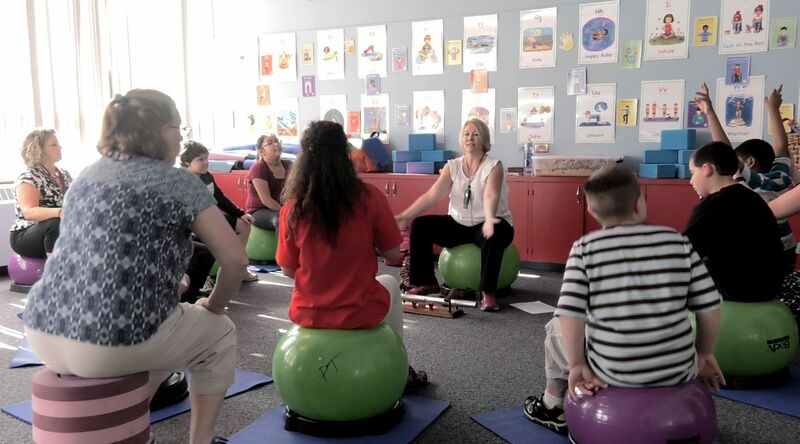 Meriden educators recommend the Bosu (half ball), therapy balls, and Lily Pads. The balls are for therapeutic use only, not for play. 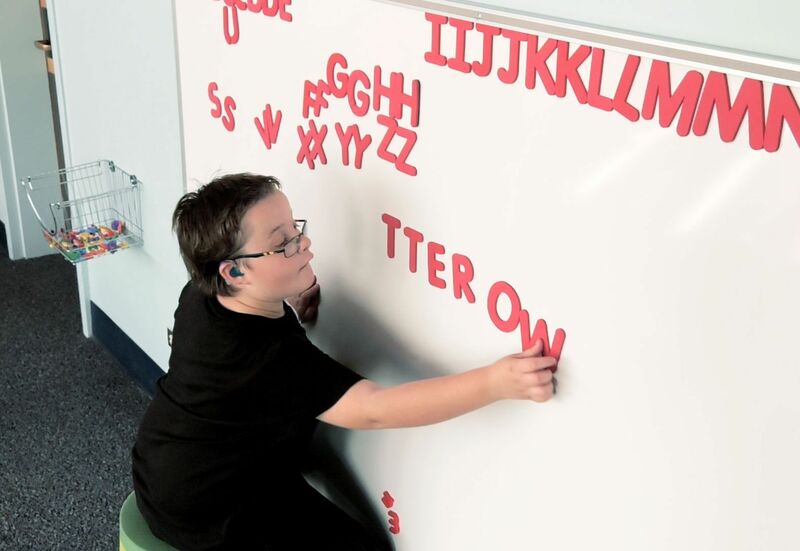 Whiteboard: After bouncing, students go to the whiteboard station, where they can use magnetic letters or do Lazy 8s with markers to develop fine motor skills. This station is also the choice area, where students decide which stations they want to visit. Once they choose a station, they remain there for three to five minutes and then either transition around the room or return to the whiteboard to make another choice. A student at Hanover Elementary works at the light wall to improve her sense of where her body is in relation to other people and objects. Light wall, punching bag, and battle ropes: The light wall allows for heavy work, which gives students the safe proprioceptive input they need to calm their body and feel more oriented in space. The students may use heavy red balls to hit the lights. There are many games, including Simon and Connect Four. At Hanover, students use the light wall either individually or in pairs. A punching bag and thick battle ropes also provide opportunities for heavy work. Mirror wall: This station allows students to use visual feedback while playing. You can create one by attaching shatterproof mirror tiles to a wall. Students can write or draw on the mirror with a small dollop of shaving cream, which provides an opportunity a calming tactile input. Lego wall: The Lego wall is a great fine-motor-skills activity for students, made by screwing Lego bases onto the wall so that students build out from the wall instead of the floor or a table. Students love Legos, and according to Sullivan-Kowalski, Meriden’s director of pupil personnel, “Occupational therapists love them, too.” Building things is a great way to organize a child and provides a calming activity. Bubble tube: The sensory bubble tube—a glass tube that’s lit from within and has bubbles that create shifting patterns of light—is located in a quiet area and adds to the relaxing environment with calming visuals and sounds. Students may bring a book or quiet activity into this area, lie in a beanbag chair, and just relax as they organize themselves and prepare to go back to class. Body socks like this one help students calm themselves. Tactile center: At Hanover, educators put out plastic bins and containers of beans, rice, and sand. Students work on their own or use activity cards to make sequences and patterns—using only one material at a time to prevent mixing. The feel of the materials in this section is very calming and therapeutic, and this activity presents a very low demand for students while providing a great deal of sensory input through the hands. Rowers: As students work the oars on a rowing machine, they get safe heavy work, which improves their focus and orientation, and helps them calm their bodies. If the oars are too heavy, staff members allow students to push and pull the oars with their legs. Meriden’s lead physical therapist, Heather McDonnell, cautions that educators should take care that rowers are used appropriately to ensure that students get the desired effect and to prevent damage to the machines. 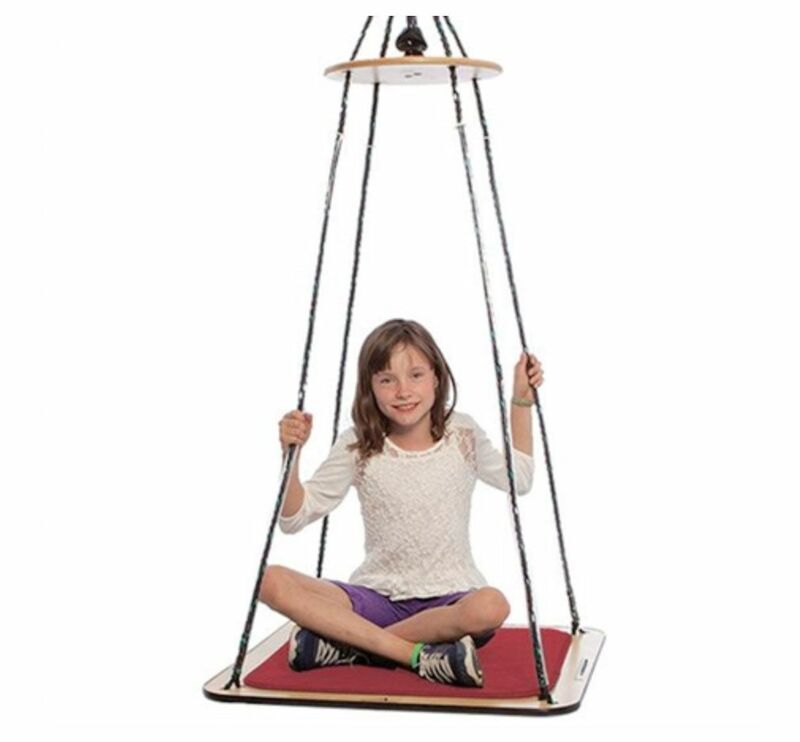 Platform swing: The swing provides the appropriate vestibular input necessary to calm and orient a student. At Hanover, students may sit or lie on their belly on the swing—no standing. Only one child is allowed to use it at a time. Some students may think it’s for recreation, so it’s important to enforce the rules: “If your student has not been identified with needs that require a specific protocol, use of swings outside is recommended,” says Sullivan-Kowalski. When Do Students Use the Sensory Room? At Hanover, there are five classes of eight or nine students with autism. Each of these classes comes to the sensory room for half an hour a day. Specialists can also schedule time with the physical and/or occupational therapists for one hour a week. The physical therapist and occupational therapist collaborate with each specialist to provide programming, music, and lesson plans. Does the Sensory Room Benefit Kids Who Have Lived Through Trauma? Meriden has three sensory rooms in all, and each is designed to meet different student needs. When working with students who have experienced trauma, it’s important to have input from a team—typically including the school psychologist or a social worker who is trained in trauma-based services—as to what is appropriate and what is not. Who Manages the Sensory Room? Trained staff members take care of each of the three sensory rooms. Meriden Public Schools’ head of occupational therapy, Kathleen Fritz Romania, and lead physical therapist, Heather McDonnell, train these staffers. Platform swings like this one provide students with vestibular input that helps improve their sense of balance. Develop a program and protocol for how staff should use and maintain the room—and make sure your staff is trained. “Everyone needs to understand the purpose of the room, what each piece in there is for, and how to put it away after use. Students also need to follow a routine, so that they don’t come in and act like they’re at Disneyland, bop all around, and then leave it in total devastation,” says Romania. Locate your sensory room in a central location within your building if possible. At Hanover, the sensory room is directly across from the school office, which makes it easy to keep tabs on the room and to ensure that the staff is using it correctly and that equipment is being maintained properly. In the other two schools in the district with sensory rooms, those rooms are located in the farthest corner from the office, making them more difficult to monitor.